For people who suffer with migraines, you know how debilitating and painful it can be. Most people understand what a headache feels like. A migraine is very different from a general headache. Migraines can be a lifelong battle some have to face on a regular basis. These people miss out on time with their loved ones, lose time at work, and may feel their life is being robbed – one day (or week) at a time. There are many options for treating migraines, but most people are looking for natural migraine relief. Medications and injections may offer some relief but they do not address the cause of the migraine.If the cause is not addressed, migraines may continue to occur. There are lots of ways to decrease the symptoms of migraines. But often, these are just temporary fixes that enable us function in between episodes. Natural migraine relief does exist. Upper Cervical Care offers a correction to what may be the cause of certain types of migraines. By not treating the symptoms and getting to the cause, we hope to help you finally overcome this struggle and be able to reclaim your life. A migraine is pain associated with the head. There are a variety of different patterns migraines may present as: diffuse pain around the head, pain located on one or both sides of the head, pain over one particular region, or a migraine may even feel like it travels from one point to another. The quality of the pain also varies from a dull ache to throbbing to sharp pain, or tension head-stuck-in-a-vice pain. The severity may fluctuate during the episode. A migraine may appear gradually over time or suddenly. They may last for an intense few minutes, a few hours or even days. Be sure to note if one episode feels different then previous episodes or you feel as though they are getting worse. Associated feelings might also include: nausea, inability to concentrate, irritability, helplessness, fatigue, mental fog or drain, and increased stress. However a migraine presents, there is no such thing as a normal migraine. How long the episodes last. How this effecting your daily routine. Methods you have used in the past for relief. As there are many different types of Migraines, it would seem plausible that there are many different triggers for Migraines. It is important to differentiate a trigger and a cause. Many of us suffer occasional headaches due to our lifestyle choices. Others, have regular, intense bouts of pain which is not due to a trigger. There is a relationship between upper cervical (neck) trauma and migraines. Some known triggers are listed below. The cause and exact reason why certain people suffer chronic migraines has been difficult to pinpoint. However, research is beginning to point toward head and neck injury as an underlying cause for many types of head pain, especially migraine, cluster and tension headaches. This is becoming increasingly apparent for researches and patients who have had the injury addressed and corrected by upper cervical chiropractors. This may be the solution for natural migraine relief. When there is stress on the nervous system the body responds to that stress. In the upper part of the neck, there is a vertebra that is commonly found to be in an improper position, causing stress and nerve interference to the nervous system. With the stress and interference, muscles can tighten and pull on one or both sides of the neck and head causing constant pain and impaired body function to develop. Using multiple therapies or taking medication may temporally relieve the pain, but it does not take care of the main cause. A specific upper cervical correction unlocks the misaligned vertebra, relieves interference on the spinal cord and nerves, removes tension from the head and neck muscles and restores postural balance to the body. This is also how many people find natural relief from their migraines. But the primary objective of upper cervical care is to remove true consistent nerve pressure and by doing that allows the nervous system to become healthy once again. Suspected head or neck injury – Whiplash, concussion, fall, accident, etc. Making a few minor changes in your lifestyle can make a big difference with headaches and migraines. Reduce Stress – One of the most common causes of headache and migraine is emotional and mental stress. A vacation every year seems like a great way to de-stress, but a more frequent reprieve from stress may prove more beneficial. Take advantage of the weekends and holidays to relax. Find a productive outlet to vent your stress. Avoid Food Triggers – Avoiding foods that trigger migraines is an important preventive measure. Common food triggers include monosodium glutamate (MSG), processed lunch meats that contain nitrates, dried fruits that contain sulfites, aged cheese, alcohol and red wine, chocolate, and caffeine. Keeping a headache diary that tracks diet and headache onset can help identify individual food triggers. Eat Regularly – Eating regularly is important to prevent low blood sugar. Stay Physically Active – Exercise is certainly helpful for relieving stress. An analysis of several studies reported that aerobic exercise in particular might help prevent migraines. Sleep – Improving sleep habits is important for everyone, and especially those with migraines. Migraine Causing Medications – Medications may trigger migraines or make them worse. Talk to your doctor about whether you should stop taking these types of medications or reduce the dosage. 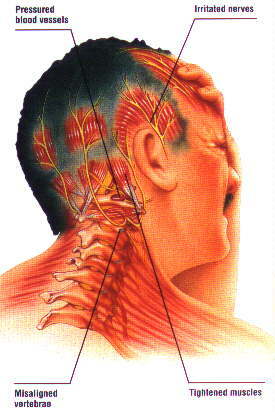 Case Studies that may relate to natural headache and migraine relief with upper cervical care. Blog entries that may relate to natural headache and migraine relief with upper cervical care.